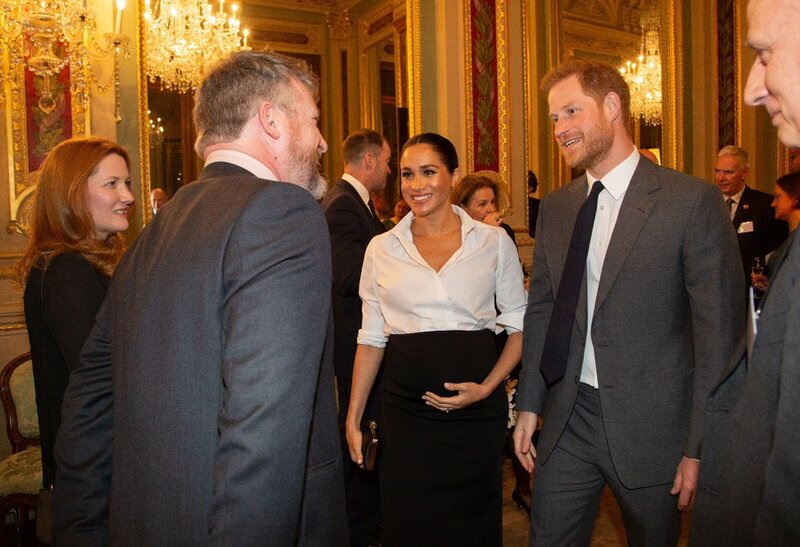 The Duke and Duchess of Sussex attended the Endeavour Fund Awards Ceremony, with both taking to the stage to present awards. The Duchess of Sussex wore a bespoke Givenchy evening ensemble. Meghan chose a Clare Waight Keller for Givenchy monochromatic shirt and skirt combination. Meghan sported an oversized white shirt with open collar and hidden button placket. The Duchess wore her shirt with the sleeves rolled up to her elbows and the shirt tucked neatly into her skirt, giving a relaxed yet formal vibe to her outfit. The Duchess wore a Givenchy black maxi skirt with a long thigh high split up one side. The skirt neatly covered her baby bump. This ensemble is completely bespoke and is unavailable to purchase at this moment. We show below some black and white looks from Givenchy Fall Ready-to-Wear 2019 collection where these colours featured prominently. From a purely fashion world perspective, the choice of this ensemble from Givenchy is quite confusing. A fitted white shirt with collar that is tucked into a maxi ball type skirt is the iconic look of Carolina Herrera. So it would seem strange that you would ask another fashion house to create the iconic the look of another designer. Every designer has a signature piece(s) in their collections which make them recognisable to the fashion world. Sometimes they are just small nuances, or the colour or placement of hardware on garments, bags or shoes, or a particular silhouette or fabric. For example we know that skulls are representative of Alexander McQueen and that arched back heels with pearls under the sole are Nicholas Kirkwood. We know that a printed wrap dress is from Diane von Furstenberg and a bag with a chain looping around the entire bag into the strap is a style from Stella McCartney. A quilted leather flap bag is from Chanel, red soled shoes are from Christian Louboutin and a horse bit loafer is most likely Gucci. We could give many other examples these are just a few. Meghan added a new pair of Aquazzura mules. Meghan chose the ‘Rendez Vous’ suede and metallic leather mules in 105mm, retailing for £530. The heels have a black suede pointed toe with multiple gold metallic thin straps across the foot and gold toned signature Aquazzura pineapple on the sole. We think these mules look quite fabulous but would be wary of so many thin straps across the front of the foot, as it may cut into your foot causing some discomfort; they might however, be elasticated to prevent this. You can purchase these heels here. Meghan carried her Givenchy satin clasp with jewellery clasp. The black satin rounded edge box clutch has a gold hardware hinge and double pointed end jewellery clasp, also set into gold hardware. We have seen this bag on multiple occasions including the Duchess’ first time attending Royal Ascot. This clutch is no longer available to purchase. Meghan accessorised with her Vanessa Tudgendhaft ‘Precious Clover Earrings’, retailing for £656. The rose gold clovers are made up of four small heart shapes inlaid with pave diamonds. You can purchase these earrings here. Try these earrings to get the look for less here. The Duchess of Sussex added a new pretty and feminine pink ring from Ecksand. Meghan wore the ‘Cirque Ruby Ring’ style retailing for £1,243. A claw setting encases the cabochon faceted cut ruby on an 18kt yellow gold band of pave diamonds. We like this choice of ring very much, as it is much softer and less street style/trendy than the rings she normally chooses to wear to Royal engagements. You can purchase Meghan’s ring here. Many royal fashion watchers found this look from Meghan a little plain and boring especially for an evening gown type event. However, it must be quite difficult to be formally dressing during the later months of pregnancy, when we are sure Meghan would prefer to be tucked up at home watching Netflix in her comfy pyjamas!